A tamale is a traditional Mesoamerican dish made of masa (a starchy dough, usually corn-based), which is steamed or boiled in a leaf wrapper. The wrapping is discarded before eating. Tamales can be filled with meats, cheeses, fruits, vegetables, chilies or any preparation according to taste, and both the filling and the cooking liquid may be seasoned. Tamales are a New World food made by wrapping various ingredients in a rich corn dough, and then wrapping corn husks, banana leaves, or corn leaves around the dough parcel to create a packet, which is then steamed. The finished tamales are typically eaten plain, although they may be accompanied with a variety of drinks, depending on the region, and sometimes sides like beans as well. 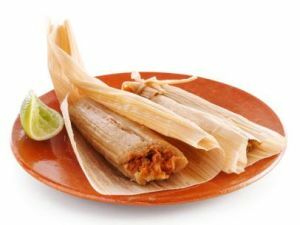 Many people associate tamales specifically with Mexican cuisine, where they have been elevated to an art form, with various regional specialties which feature an assortment of ingredients ranging from chocolate to shredded beef. However, tamales are also eaten in other parts of Latin America, and they were once eaten by Native North Americans on a fairly regular basis, as early colonists attested. Nutritionally, tamales have a lot to offer. The corn dough is typically made with masa, a form of nixtamalized corn which has been treated with slaked lime. The corn dough is highly nutritious as a result, and the filling may add to the nutritional value of the tamales with ingredients like protein-rich meats and fresh produce.